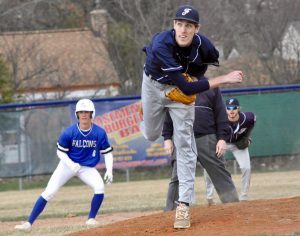 The bats were alive while pitching and defense lagged behind in their effectiveness Tuesday, as Rochester and Farmington played a three-hour, high-scoring game. Though it led from start to finish, Rochester needed to keep adding runs throughout to fend off Farmington for a 16-8 early-season victory. The first inning was filled with offense for both clubs as the teams combined for 13 runs. Rochester’s lineup batted around in its first turn up to bat, producing eight runs to take a commanding lead early. Leadoff man Bobby Kronner had two hits in the frame, including a two-run single. Undeterred by the hole it found itself in, Farmington answered back with five runs of its own in the bottom of the first inning. Senior Dave Harrison delivered an RBI double, while two more runs came in on a costly defensive error. An inning later, Harrison drove in another run to trim Farmington’s deficit to two, down 8-6. Rochester picked up two runs in the top of the third when Nick Stepke and Devin Murray recorded an RBI hit apiece to make it 10-6. 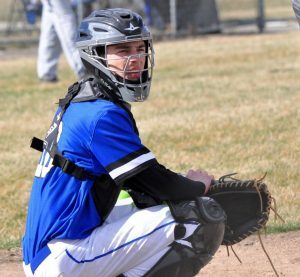 Farmington missed on prime opportunities to climb its way back into contention in the third and fifth innings when it loaded the bases. Each time produced just one run, however, as Farmington couldn’t produce a hit with runners in scoring position. In the top of the sixth, Rochester’s Noah Stout clubbed a two-run home run deep to right field to make it 15-8. With good hitting by both teams, it wasn’t until the bottom of the sixth that a pitcher recorded a clean 1-2-3 inning when Rochester’s Scott Russell got into a groove on the mound. Rochester improved to 6-2 on the season with the victory, having played several games while other teams were idle on spring break. Tuesday’s game was Farmington’s first of the season.